By special request (or was that a threat?). 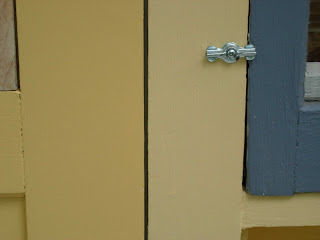 Last night I painted the wood trim around my front door. 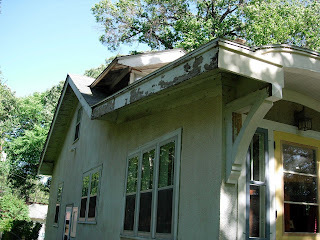 I stripped off all of the old paint last summer. 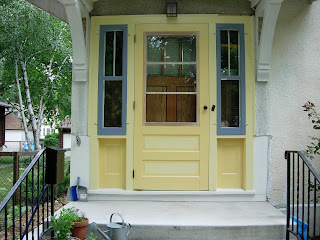 I still need to buy "porch" paint in the darker yellow to use on the threshold. I have plans for the sections on each side where the old concrete stair rail once met the building - I'll post about that in the future. And of course, I still need to find the missing moulding to put in the upper right corner above the door (unpainted for now). I'm planning on stripping and painting the front window trim next. One day I may do a post on choosing the paint colors, but the short version is that this is pretty much what the house was originally colored (except in the old days the gray storms were exchanged for green screens in the summer). 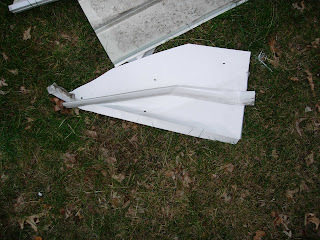 And finally, a photo of the last piece of aluminum on my house. Just cuz it makes me laugh hanging there. I was dreading today. I woke up an hour before my alarm and just laid there and listened to my clock wishing the day had already passed. When my alarm finally went off, the morning show annouced it was supposed to reach the low 90s today. Uhg. So, I hauled myself out of bed to get an early (and hopefully shaded) start. I knew I would be filthy so I skipped the shower and threw on my oldest clothes. I needed a coffee to get myself going but couldn't show my face anywhere in town looking like I did.....so, I hopped in my car and got an iced coffee from McDonald's drive through (not half bad). When I got back to my house I started the dreaded task. Ripping down the final stretch of aluminum. I decided to try to get as much of the end metal down before I reached the main wires. I'll admit there was a tiny pause before I touched the main electric line....while I considered for a moment that tomorrows newspaper headlines could read "Trainie from Excel Accidently Disconnects Power to Wrong House and Beloved Bungalow Owner Dies a Tragic and Painful Death." The aluminum now is (**almost) down from my entire house. Each bay between the rafters has been caulked. Of course, I stepped on the obligatory nail (I've had my tetnus shot). If I never have to do that again in my lifetime, it will be too soon. I celebrated by ordering out. 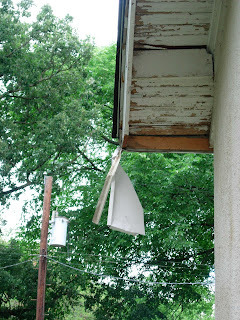 ** There is a small piece of hanging aluminum on the back side of my house. I had reached my breaking point. I was weary. 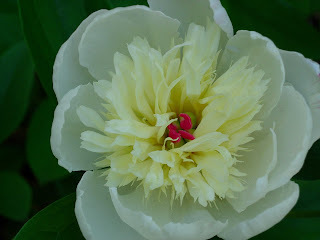 I could not force, nor bribe myself to move the ladder yet again and pull it down. Later, I'll do it later. Stick with me on this one. It is house related. I am a fan of Aveda products. I use their shampoos, lotions, cosmetics, candles, etc. So, when they started a frequent buyer program, I signed up. A month or so ago I received a little note telling me I had enough points to order a reward treat. Off to their website I rushed to see what my treats might be. I had the minimum number of points, so my choices were pretty limited. 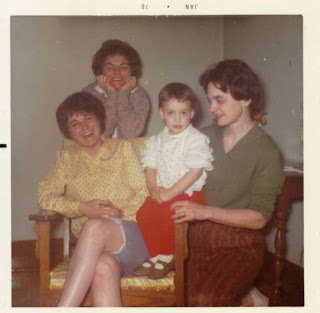 A candle.....a set of travel sized products....then a saw a reward that looked promising. I put my reward order in. I could not figure out what the UPS guy was delivering in the very large box until I opened this. 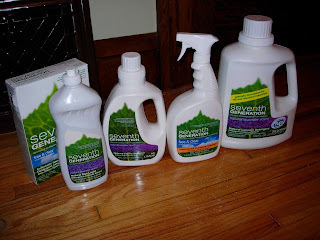 A supply of full sized Seventh Generation cleaning products (I refuse to use the word "green" because I am tired to death of hearing it a bajillion times each day). Not bad for a free gift, huh? My mom called me last week. She and my aunts were cleaning out my uncle's house. My uncle (and Godfather) passed away last December. My mom was wondering if I would be interested in having a set of old table lamps that were originally my Grandma's. She described them on the phone and I immediately had an image in my mind of which lights she was talking about. I told her I wanted them. 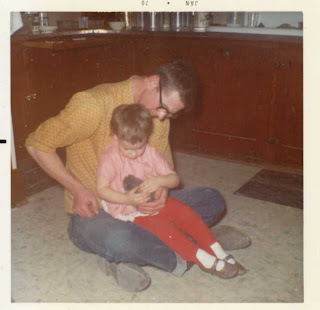 I had no idea how I could remember what the lamps looked like, so I pulled out a few old photo albums of mini-me when I was visiting my Grandma's farm. 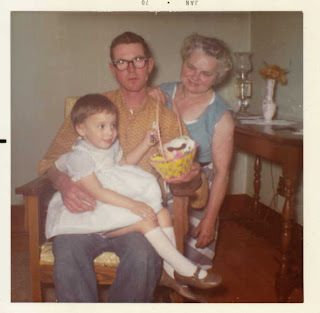 Sure enough, I found a picture of me, my uncle and my Grandma with one of the lamps in the background. 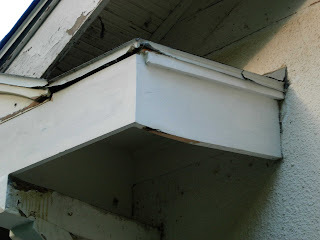 Yesterday I phoned the electric company to schedule a truck to come out to disconnect my electrical for a few hours, so I can remove the remaining aluminum trim on my house. 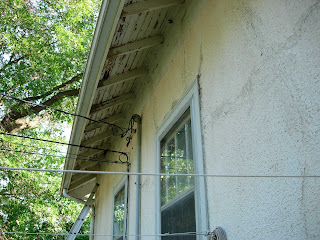 My electrical wires run very low near my gutter. I decided I'd really rather not electrocute myself while removing the metal trim. They have me on the calendar for next Monday. This is good because it gives me a deadline and forces me to get this done. From the instructions they gave me, the electric company guys will disconnect the wires...and then I need to call them when I am done and they will reconnect the wires. I figure it will take me 2-3 hours to pull the aluminum down. An interesting side fact. 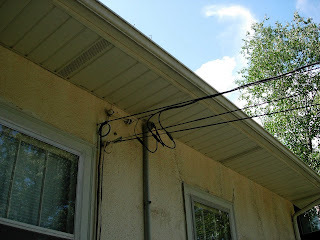 I asked about having my wires moved onto a "wand" that would raise them higher onto my roof. This would let me actually clean my gutters. The electrical co. rep. said that the point where the electrical attaches to the house is the homeowner's property. So, I need to call an electrician to have this done. I might add this to the list of things I want done....it sure would make life a lot easier. It will be nice to finally have that aluminum gone. Yesterday evening I noticed the motion detector light on my garage had turned on. It's not totally unusual for it to go off, but when it does I usually take a look outside to see what might have set it off. I took a peek out my back window and then remembered that I was going to water my roses before it got too dark. 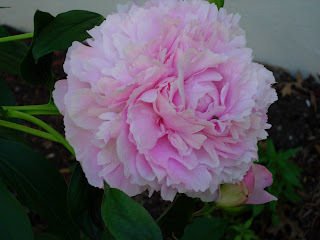 So, I went out in the back yard. While I watered the roses, I noticed my neighbor's garage open. Long story short - I was 97% sure that they were not home this past weekend. It would also be very unusual for someone on my block to leave their unattanded garage open. No truck & no lights on in the house. Something was off. I went inside my house and opened the shade in my back window. Nothing changed. No people. Garage door open. Keep in mind that something similar happened to me a couple of years ago. I have chatted with these folks over the years, but had no idea what their name was. I debated what to do. 1) mind my own business and do nothing. 2) go over there and try to figure out how to shut the door myself - assuming there was no gun wielding drug addict lurking in the shadows (okay, I'm being overly dramatic). 3) call the cops and explain the situation and ask them to drive by. I opted for #3. The cops came and took a look-see & shut the door. Once again, all is well in Stuccoville. So, does this now qualify me as the neighborhood busy body? 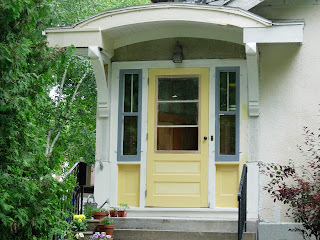 I have the front door surround wood stripped, and I have the front window trim in a place where it would be easy to paint. But, for whatever reason both are missing pieces of trim. On the left hand side by my front windows the PO used flat replacement trim. In the right hand corner above my front door, they just left it partially missing. Now this trim is probably on 95% of the old houses in the midwest, so you would think that it would be carried as stock in every lumberyard & home improvement center. Au contraire. Earlier this week I made a trip to Menards & Home Depot on the off chance that they carried it. Nope. Today, I drove to the other side of the city to visit Scherer Brothers lumber yard. They have a few companies that make moulding that they stock. This was a last ditch effort because they have increasingly crappy customer service and I end up being ticked off every time I leave the store. I can't figure it out; I used to love that place. They also didn't have it. Or at least while roaming the store myself I wasn't able to find it....or anyone not involved in paperwork to ask. I figure if I'm going to go through all the effort to match the trim, I may as well get it exact. I have two other sources to check out, but it seems most of theplaces carry the same stock mouldings from the same out-of-state suppliers, so things don't look promising. There is a place near me that will custom make a knife to cut the moulding to match, but this would be very pricey - and for about 10' of trim I'm trying to avoid this. The type of trim I need has various names. The one most commonly used is "back band." 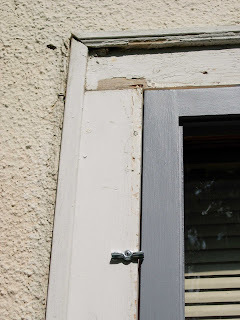 It comes close to picture frame moulding in that it has a little base that sits in the stucco and the trim that lays on top of the rest of the wood trim. 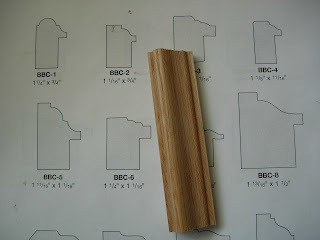 I've even toyed with the idea of using window stop trim with the right profile and nailing it to the remaining wood from the old trim. For now, I'll probably just paint everything but those sections and then touch up the paint when I find a replacement. 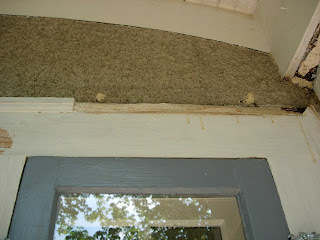 I know I have been excruciatingly slow on this front door overhang missing board project. I don't blame you if you lost interest long ago. But for the sake of showing a little progress, I'm posting a photo of the board to date. 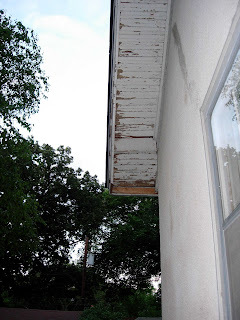 A quick recap: Last summer I pulled the aluminum trim down the from the overhang over my front door. 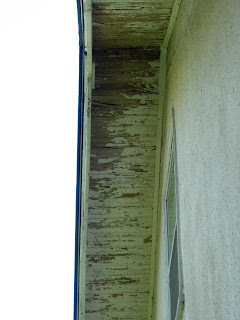 It was quite rotted and needed a lot of work. One board was filled with carpenter ants and was so rotted it just fell to the ground. 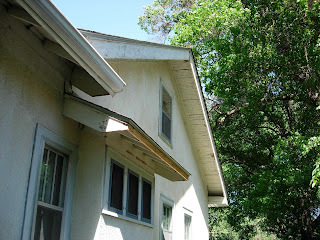 The overhang itself was fairly easy to do, but replacing the rotted board was a challenge for me. If you want the whole story with photos, use the label "overhang" below. Then finally I can add the copper drip edge. We have had a string of days with temps in the 90s. So, of course this is the week that the city decided to replenish it's supply of free wood chips. With all of the money I've been forking out on other projects....with the weeds making a comeback in my garden...and my general dislike for watering.....I decided this was the way to go this year. Minneapolis has a bunch of sites around the city where they offer free woodchips. Today I happened to be driving by one when I noticed the pile. They go fast. In the past I've waited a day or two and there is nothing but crumbs by the time I return. So, today I hustled myself home, got two plastic, 18 gallon bins & my shovel and rushed back to the mound. There were already three other cars there when I got back. I made two sweaty trips for a total of four plastic bins - 72 gallons. At this point I probably have half of what I really need. 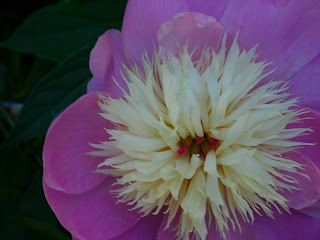 I'll try to stop back tomorrow and see what is left. It's not the prettiest, but it does the job. Next year I'll switch back to the beloved, yet oh-so-expensive, cocoa mulch. 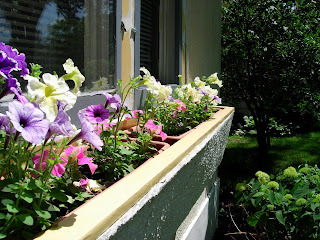 My window box is now completed and I've filled it with petunias. I hope the flowers give the house some minor curb appeal while everything else is being worked on. Note this year's purple & gold theme. 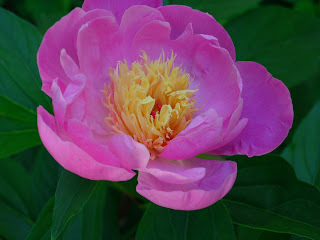 It seems my peonies sensed a need for some beauty to offset everything else that is taking place at StuccoHouse. 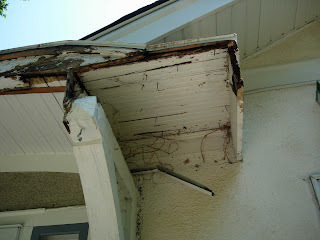 I hired a handyman to remove the remaining aluminum trim from the high side eaves. It was a little too high & tightly attached for me to handle. Money well spent, I'm thinking. It was nasty work. I know it's odd, but it just seems that the house is breathing better tonight. What a project I have this summer, huh? 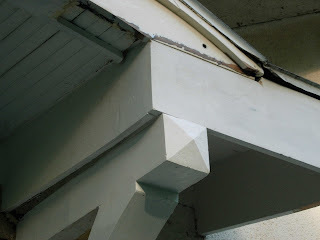 Take a look at that front bracket where I have restored the fascia....and then you turn the corner to the newly uncovered wood - there is hope. It's up. 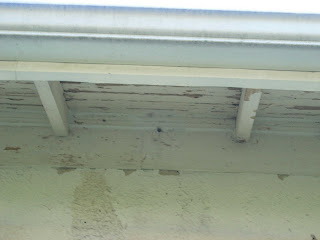 The missing board on my front door overhang is in place. Finally. I'm sure a carpenter or anyone with some carpentry experience will get a good chuckle, but this took me a long time to do. In my defense, there was a lot going on up there. In short, here were the complications: The arch of the overhang is not anywhere near uniform. The arch itself had sunk about an inch on the right side - and there was no moving that arch anywhere at this point. 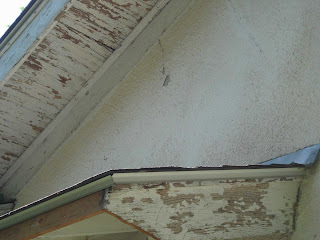 Finally, no matter how hard I willed it to be, a board could not rest on the top of the bracket....run horizontal.....and meet the bottom edge of the far most board coming out of the stucco. For the life of me, I still can't figure out what went on there. Still, I got the board cut, I used my dad's tip about using a pencil compass to scribe out the sinking section, and I got it up there and attached. I had to epoxy the corner where the new board met the old, drooping, formerly rotted, somewhat curved board. 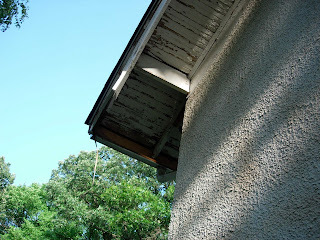 I'm still not fully clear what is supporting that overhang (it's not the brackets), but I try not to dwell on it. Next, I have to sand the edges, trim about a quater of an inch off the bottom of the board coming from the stucco on the far right, reprime, add the 1x2 trim and paint. 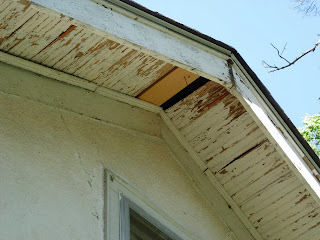 Then I'll be ready for the new drip edge. It rained on and off most of the weekend, and to be honest I was a bit relieved. I'm a little maxed out on the whole house thing. It was nice to have a reason to take a break. My big accomplishment was that grass has now sprouted in the final section of front lawn I had to reseed because of my sewer lateral line replacement. I posted about the first section that I filled with dirt. 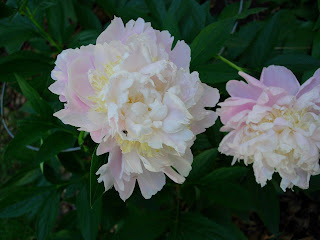 There were two more after that, but I figured the charm of reading about reseeding would grow thin after one post, so I spared you the details. I finished the last section last weekend. In the end I hauled about 70-80 forty pound bags of dirt and reseeded essentially 75% of my front lawn. I have arm muscles I never knew exisited. Anyway, the grass is well on it's way and I can now move this project to the back of my mind where it will fade to a distant memory.